In 1946, the eight-year-long truce between Nationalists and Communists that had held together during the War of Resistance against Japan finally broke down. Both sides raced to seize cities and rail lines in China formerly held by the Japanese. By November, 1948, the Nationalists had suffered severe reverses in Manchuria and the north. The Communist leadership decided the time had come to move into central China, so they targeted the area around the strategically crucial city of Xuzhou, about halfway between Beijing (Peking) and Nanjing (Nanking). The result was an enormous battle of annihilation that involved over half a million fighters on each side. The Communists also mobilized as many as five million peasants to help move supplies. This is very much an Against The Odds! situation: The Nationalists are well-armed with air support, artillery, road mobility, and tanks. And yet it is the Nationalists who are going up "against the odds"! Despite their material superiority, most Nationalist units have morale so low that "defectors" from their army are the main source of replacements for the Communists! The Communists are light, lean, and very well-motivated. The battle develops asymmetrically between the powerful but ponderous Nationalists and the mobile Communists. 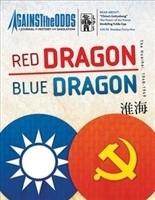 Designed by Earl Dixon, Red Dragon, Blue Dragon: The Huaihai 1948-49 features a map drawn to 20 kilometers per hex, with one week turns. There are over 150 unit counters and markers. Units are mostly Nationalist "Corps" and Communist "Columns" of about 20,000-30,000 soldiers. There are also artillery regiments and tank battalions: the Communists have a few; the Nationalists have a lot more. Both sides are subdivided (as they were historically) into "sub-commands." The rules cover unique aspects of this struggle: Nationalist Defections, Communist Guerrillas, the Propaganda Offensive, Communist "Short Attacks", Communist Re-Education, Red Militia, Nationalist Final Defense Positions, and more. Players may discern the early origins of the ferocious Red Chinese attack against UN forces in Korea a mere two years after this battle, as well as elements of guerrilla warfare that later became familiar in Vietnam. Virtually unknown in the West, this battle is quite familiar to mainland Chinese and to those on Taiwan as well. It's a fair description to call it the "Gettysburg" of the Chinese Civil War.